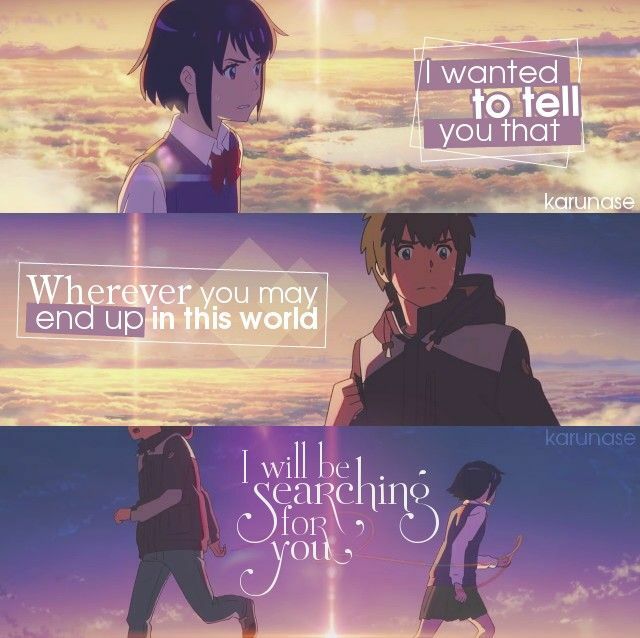 I remember watching Kimi no Nawa this year, when a classmate graciously gave me the downloaded file as a late birthday gift, in my living room. I sat, alone, the curtains drawn shut, the lights switched off, the room dark and the colours outside grey and blue smudged together. Just as I liked it. Your Name, was one of the few anime I had watched without reading the manga, and the second anime movie I had watched on my television instead of the computer screen. It was a beautiful story, but it was when Nandemonaiya played that I started to cry. Tears and tears rolled down my face and I caught myself singing despite hearing the song for the first time. 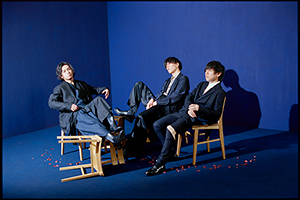 In Nandemonaiya, the piano and guitar blend to form something heartbreaking and tear rending. While I, for one, already have a record for being overly emotional with music, anime and movie, this one being all three physically hurt me. Even ignoring the beautiful lyrics, the music alone does things to the heart. A true blend of melancholy, nostalgia, regret and sorrow, this is probably one of my favourite anime songs yet. The underlying theme of missing someone gently tugs at your emotions and makes you think of someone who left as well. 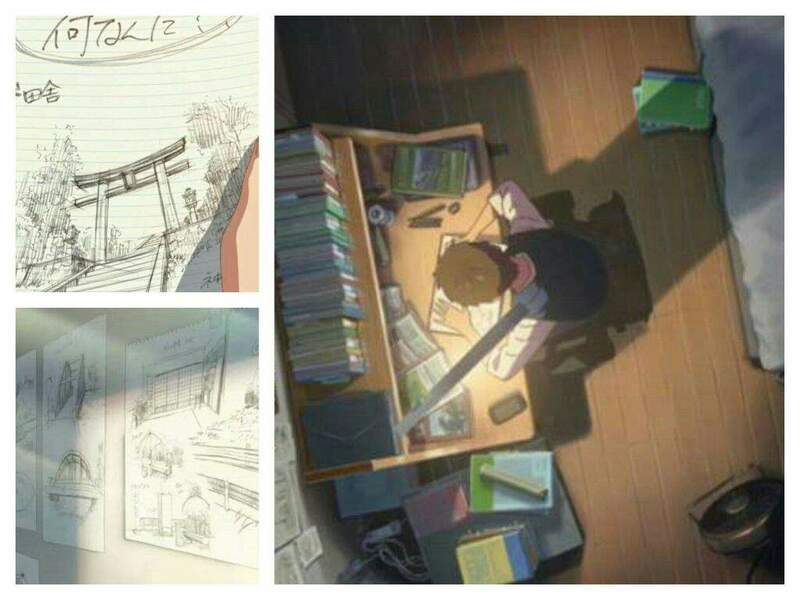 The story focuses on two main characters- Mitsuha Miyamizu, a schoolgirl in rural Japan who desires to live in the city even though her fate and family is intertwined with the town, and Taki Tachibana, an aspiring architectural student in Tokyo who lives a typical high school student life with a part time job. With the passing of an unusual comet, the two start dreaming of out of body experiences, in which they quickly realize that these aren’t dreams, but the actual experience of swapping of their bodies and consciousnesses. Where did it find the loneliness it carried on the breeze? There’s a strange emotion associated to falling in love with someone you never met. It’s a sense of happiness so great, it’s pain; it’s a feeling of loneliness so large, it’s sorrow. Taki-kun has this strange sense of sorrow about him, which mostly manifests in his quick temper. It’s the sorrow of forgetting what you love and the forgetting of the reason of your sorrow. The sky mentioned in the first verse matches perfectly with the comet falling in the movie, and how it’s everyday things like wind remind him of something (someone) that is missing from his life. But this something has escaped the memory of mind, and the sense of loss cannot be described, much like how the blue of the sky can only be called ‘sky blue’. Mitsu-chan had a turbulent relation with her father, a control freak who is standing for elections, and found herself withdrawing into herself just to avoid being associated with her father. Mitsu-chan also found strength from Taki-kun, especially when she lived after Taki-kun took over some days of her life. The strange romance that blossomed out of never meeting one another but being each other, drew on their strengths and helped them cover for their own weakness. But I feel that the ‘kind heart’ referred to here is her grandmother, who single-handedly brought Mitsu-chan up and into the beautiful person she became. I think this verse is self explanatory as to the lake edge where they meet, knowingly, for the first time. Tragically, their time runs out just as Mitsu-chan was about to write her name on Taki’s hand,and so, understandably ‘just a little longer’. One of the extremely tragic scenes of the story includes Mitsu-chan looking at her hand only to find ‘I love you’. Again, this chorus alone gives us the gist of the whole movie. The tragic reality of loving someone you can never meet, the happiness of finally being able to do that and then the bitter disappointment of falling short. Both Taki-kun and Mitsu-chan wake up to tears at the beginning of Kimi no Nawa, without a reason. Stars meet Taki-kun. Taki kun meet stars. With this verse we can get back to Taki, in the time between after he meets Mitsu-chan and time which he forgot about his dreams. There’s this desperation about every search he conducts, everything he draws. Desperation and longing. I have a feeling that after Taki-kun changes Mitsu-chan’s image, she does start talking to some more girls in her class. Because ‘it’s not that bad trying something new, especially with (Taki) you by my side’. Once again addressing both their feelings when they stop their body switching, the break precisely describes the desolate feeling of missing someone. Getting ready for the excited meeting at last! He knows why, because he himself was crying too. 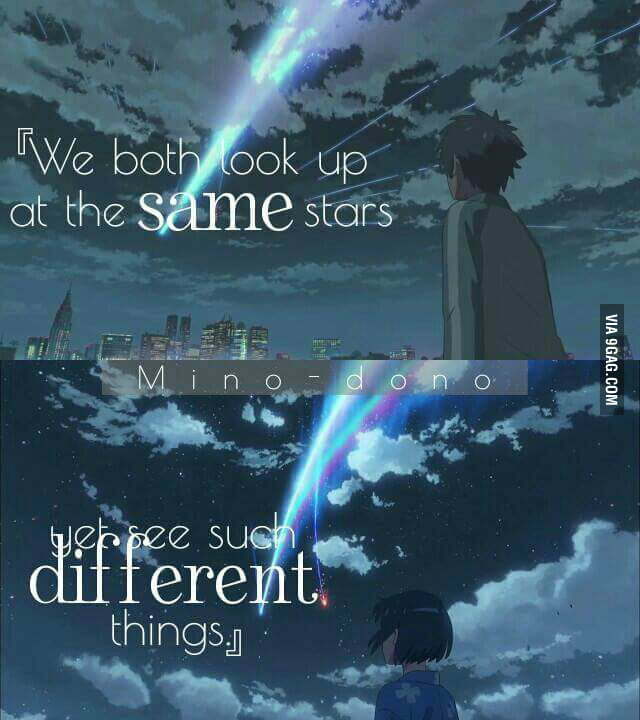 Recently, I read in a book, “Time is circular, but memories aren’t” and the only thing I could think of was Kimi no Nawa. What do you feel? Do you agree? Disagree? Let me know below! To say that this post struck a bit of a chord in me is an understatement. Wow, really, Auri, this is one of the best posts that you have ever written. It really describes your feelings in such a personal an beautiful way, that I can’t help but feel moved by it. Music can really add so much to a movie…it can make you really experience a film even more emotinally then without it. I regrettably have still not seen this film, but I just checked and saw it will finally be released here on dvd early next year. I had already heard great things about it, but after reading this post I know that I am really going to be in for a terrific experience. Shucks Rai-san, thanks so much! Ahh that’s a shame! Still, you only have a little while left to wait, so here’s to a sure good experience coming your way! A wonderful review. I still need to watch this movie and I hope I will soon. Oh yes, please watch it soon! I never did understand the father part of the song—now it is painfully clear. I also didn’t realize that the meaning of the song bounced back and forth between the two in the lyrics. Such a beautiful song. (I, too, have lost many hours just listening to it and losing myself within the music. There is one remix on YouTube in particular that always strikes a chord with me.) Clearly, you understand the emotional weight of the song, as this lyrical analysis is wonderful! Also Zenzense was also a great song, wasn’t it? Glad you liked it Al-san! I will get to it soon! Thanks for dropping by Am-san! This is absolutely lovely, your review complementing the soul-touching song, bringing back thoughts and feelings why the very scenes we cried at were also the very scenes we love for seemingly no reason. Oooh, this comment is a work of art. This a great post Riri!! So raw and emotional, and yet another perspective to appreciate this movie. I was struck by your statement: “There’s a strange emotion associated to falling in love with someone you never met…” because as fans we know exactly how that feels right? I was sooooo thinking of GD as I wrote that. 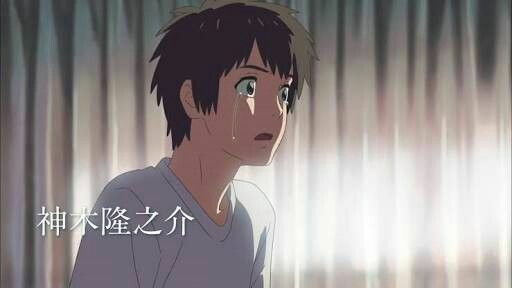 When I watched the film for the first time, I felt this sharp pain when Taki found out what actually happened to Mitsuha. The whole plot after that just kept on urging me to cry, and still I wasn’t able to (It’s a problem of mine). While some of my friends kept asking me why I got emotional, I wasn’t able to describe it because I didn’t know. Reading your article now has cleared all of my doubts. I can now feel the sadness and pain yet again, it’s so nostalgic and relatable. Loving someone you never really met, thanks for letting me fall in love with the song as well as the movie once again. Truly, this review was a masterpiece! I felt similarly for BTS’ Spring Day though…. I talked about that before too. Oh trust me, it is hard. Back when I was new to anime, I was able to cry but somehow I lost that ability of mine. It’s actually quite frustrating to not being able to shed tears even when you want to. Great post. I still need to see that movie. I feel like a hipster because I’ve followed Makoto Shinkai’s earlier work. I rewatched The Place Promised In Our Early Days Today, and boy did it still hit me in the feels. Hahaha! You should definitely watch it! I do plan on watching it. Your Name is on my Netflix DVD queue and I do want to see that film. This movie and Children Who Chase Lost Voices are the only Shinkai films I haven’t seen yet. Have you seen his other works? I’ve mostly read manga than watch anime so I have a lot of backlog when it comes to animovies. That’s fine. I was just curious. Personally, I haven’t read as much manga as I used to or know anything about the newer stuff. I’ve just been swamped with work and with my blogs. Hahaha! Yah, if you need to complain, don’t comment. Oh, want to watch it together maybe? I completely missed the posts you’ve done after Day 1. I usually just go down the spreadsheet and open everyone’s links so maybe it wasn’t updated? At least I have a lot to look forward to now. Contrasting the films key moments and themes with the lyrics to the song is a really neat approach to take, and you’ve handled it incredibly well. Good job! Oh shucks, yes, I forgot to update that! Meh, I’ll just do it at the end…. Glad you liked it Haru-san! Great post! I really enjoyed reading it and your writing style 🙂 I’ll definitely be following and am so glad you decided to share this for the December showcase! I know this comment is just a little late, but I revisited this post now because I just finished watching this movie. Honestly, I didn’t read the entire post the first time because I wanted to watch the movie first…and I’m very glad I did. I went in not knowing anything about the movie other than the fact that the two characters meet at a mountain at some point, lol. And what an experience that was… Everything happened so fast, I didn’t know what to feel, but that scene when Taki-kun finds out what happened to Mitsuha…let’s just say I couldn’t keep my eyes dry for the rest of the movie. I wasn’t paying too much attention to the soundtrack, but the songs only intensified the emotions. 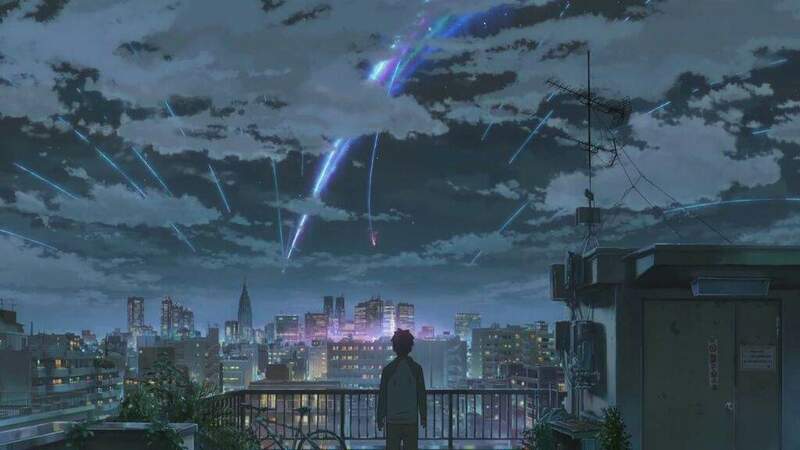 I’m listening to Nandemonaiya as I write this, and the song somehow sums up what I felt while watching Your Name…and like you said, the lyrics give a gist of the story. I want to talk about this movie in person, though…. Yay you finally watched it!